You’re turning 5 this July, but I still call you “Baby.” That’s because you are and will always be my one and only baby. You are a miracle baby, too! Your Daddy and I never thought we’d have a child of our own because of my medical condition, but God gave you to us after 9 long years of waiting. Thank you for bringing joy and happiness into our lives. We love you so much, Justin! This entry was posted in Baby, Love Letters, Mommy Moments. Bookmark the permalink. Wow, 9 years of waiting! Thanks for giving me hope. We still want to have another baby. Happy Mommy Moments. Hope you can also visit my entry here. Awww so so sweet of you Mommy! wow! 9 long years..really a miracle baby..
Oh so cute techa… and really God's love gives you the sweetest:) have a nice day..kisses to your baby! Godbless! oh that's indeed a blessing. God will give us what we want as long as we pray and wait. wow, pareho pala sila ng bday month ni Jacob…at parehong silang miracle babies :-). 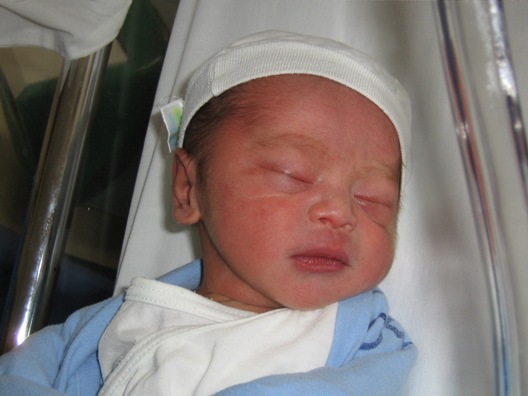 congrats…God is good and He knows you guys needed a baby…and after trying for years, Justin came…now he is almost 5! all babies are God's greatest miracles and we are so blessed to have received such miracle. God always answer our prayers in His own time, never early seldom late. Happy Valentines Day! wow! 9 years of waiting…Tetcha, he is really a miracle. 9 long years of waiting! he sure is worth the long wait! happy hearts day to you and baby justin! what a darling little angel you got there. you are so lucky to have him, and he is just as lucky to have you.. God bless your Justin..